What a wonderful opportunity for nature photography – I happened upon a group Green Herons (technically referred to as a hedge, scattering, or battery) of overly spirited Herons moving frantically about a hidden wetland one early afternoon. This particular wetland accommondates a variety of Michigan Birds. The battery of Green Herons were flying from branch to branch, low branches, high branches, with some of the birds sitting motionless, single and pairs. Another pair of herons was perched together (one slightly behind the other) appeared as though they were in deep meditation, contemplating Michigan wetland secrets or something. Or, maybe like me, they were just enjoying the spectacle of quick flight aerobics that filled the wetland air space as each these green birds of Michigan darted about. One of the Green Herons was perched in full predator pose, standing like a statue staring intently, downward at the surface of the water, waiting for the perfect moment to strike. With it’s head hunched, neck elongated; stretched to a length twice it’s body length, and with feet that curled around the branch looking more like alien tendacles than typical bird feet. 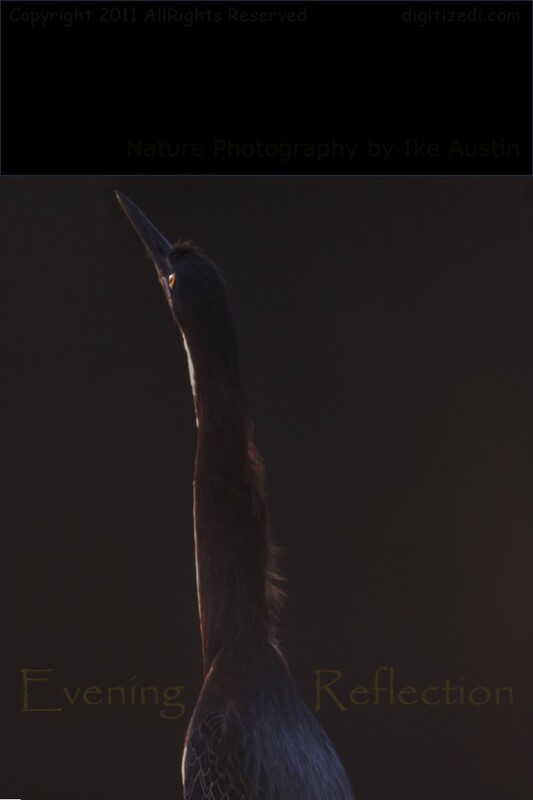 This Michigan bird is one of the strangest looking creatures in all the bird inhabitants of the wetlands and can provides some of the most interesting nature photography of this peculiar elastic neck bird. 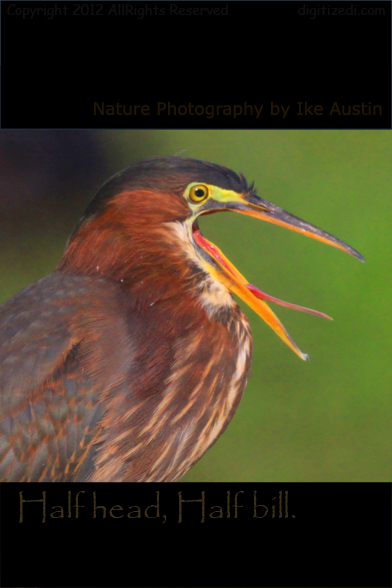 Appearance: The Green Heron is a elastic bird. At times the Green Heron is hunched in and appears short and stubby, long yellow legs, and long black beak with yellow eyes. Other times the Green Heron can stretch twicce its length. The Green Heron can swivel his head 180 degrees. Wing span can can extend to 3.5 feet. Adult: Color is Dark forest green with aztec like designs on it’s covert and wing bars plumage. Flight Characteristics: Swift and quick wings in flight and typically flapping their wings as they jump from tree. 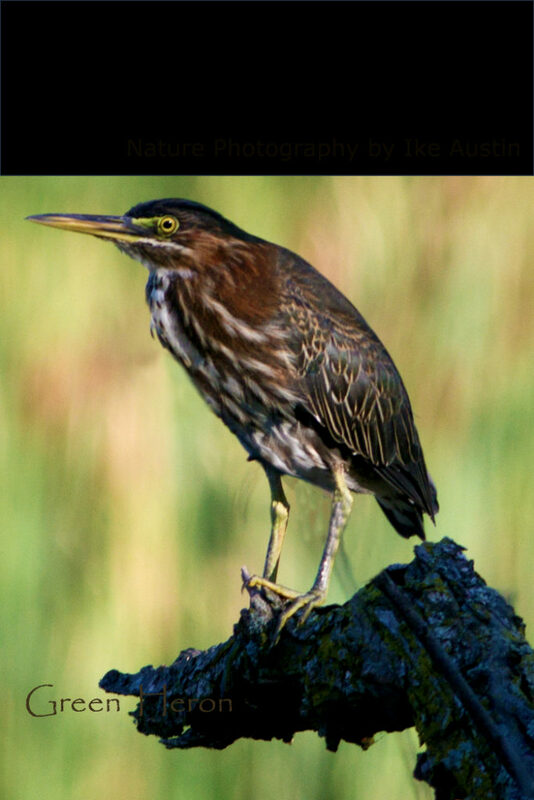 Green Herons prefer open wooded marshes, wetlands and forests. Mating Habits: The Great Heron start courtship as early as April, listenf for their mating skreeching calls. The Green Heron will choose one mate for the entire year. Migration: Traveling mostly during the night, the Green Heron returns from wammer climates in early spring. Nesting: The Green Heron will construct a nest 10-12 inches in diameter in low growing shrubs or as high as twenty feet up in trees. Incubates 3-5 pale blue eggs for appx 19-21 days. Young are feed by regergitation and independence is gained in as little as 30-35 days. Feeding: Day hunter. Small amphibians(frogs), earth worms, dragon flies and fish. Call: Very loud and skretchee sound. For some interesting and imaginative, new awareness reading… read the book below.